'I liked what he said,' former Alaska Gov. Sarah Palin said of the president's Nobel acceptance speech. (CNN) – Sarah Palin had some rare praise Thursday for President Obama after the president delivered his Nobel Peace Prize acceptance speech in Oslo. But the former Republican vice presidential nominee added that she would like to see the president act more like his predecessor, George W. Bush. "I liked what he said," Palin told USAToday in an interview after the speech. Palin said the president's remarks had a familiar ring. "I thumbed through my book quickly this morning to say 'Wow! That really sounded familiar.' because I talked in book too about the fallen nature of man and why war is necessary at times." But Palin suggested Obama could learn a few things from former President Bush. "We have to stop those terrorists over there," she told the paper. "We've learned our lesson from 9/11. George Bush did a great job of reminding Americans every single day that he was in office what that lesson is. And, by the way, I'd like to see President Obama follow more closely in the footsteps of George Bush and [Bush's] passion keeping the homeland safe, his passion for respecting – honoring our troops." Palin is the second prominent Republican to praise Obama's speech accepting the Nobel Prize, after former House Speaker Newt Gingrich called it "very good." Polls indicate that most Americans believe the award was given to the president prematurely. In his remarks, Obama acknowledged the controversy as he accepted the esteemed international prize after less than a year in the White House. 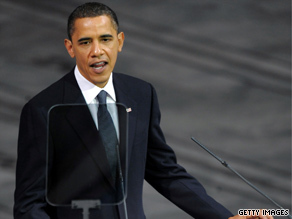 "I receive this honor with deep gratitude and great humility," Obama said in the speech. "Compared to some of the giants of history who have received this prize ... my accomplishments are slight."